Keep Leather Clean & Supple. Leather interiors are wonderfully luxurious as well as being a practical alternative to fabric. However, left untreated, leather is susceptible to a variety of factors that may degrade its condition over time. UV rays cause leather colours to fade and dry out. When it dries, leather becomes brittle, leading to cracks appearing and eventually causing rips and tears. In addition, leather is susceptible to staining from liquids and foods, greasy marks from skin oils and sun creams, and discolouration from dye transference from dark suits and denim jeans. Regular cleaning helps mitigate these issues and keeping leather protected is an absolute must to keep leather ‘as new’. For cars with convertible roofs, protection from UV is particularly important. 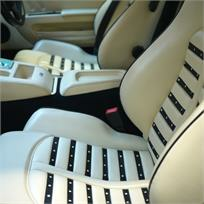 Newer leather can already be sealed so rather than nourishing, requires dust, dirt and water repelling protection. Leather Protection Treatment uses Colourlock Leather Shield to provide an abrasion resistant coating that inhibits scuffing, staining and dye transfer, as well as providing UV protection. Thorough degreasing of leather seats & other leather appendages (gear knobs, bolsters, steering wheels, etc.) using Colourlock Leather Cleaning Spirit ensuring all residues of old leather products, sun creams, skin oils are removed. Thorough cleaning of leather interior with pH-neutral Colourlock Mild Leather Cleaner using soft applicator pad & if necessary worked with soft Colourlock Leather Brush. Colourlock Leather Shield applied to keep leather supple, protecting from UV fade, staining, dye transference & to add abrasion resistance.